Resources: Books: The Exodus Happened 2450 B.C. Free shipping to U.S. addresses via Priority Mail. This book may also be obtained as part of a set of Dr. Aardsma's books through a gift to The Biblical Chronologist. Click on the "Give a Gift" icon in the banner above for more details. Title: The Exodus Happened 2450 B.C. Subject Area: Biblical history; the Exodus. Description: The Exodus Happened 2450 B.C. shows that the Exodus is a real historical event which happened 2450 B.C. in just the way the Bible describes it. From the Back Cover: Is the biblical account of the Exodus true? Is it reliable? In this ground-breaking book, the culmination of decades of research, Dr. Aardsma presents the truth about the Exodus. You will discover solid answers to questions such as: Why do many modern-day scientists not believe the biblical account of the Exodus? What is the name of the Pharoah of the Exodus? Is there any archaeological evidence for the route of the Exodus? Where did the Red Sea crossing take place? You will discover that the Exodus did happen, just as the Bible says. The evidence is truly overwhelming. 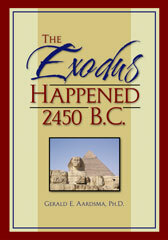 Early last evening I picked up our mail which included the book you sent, "The Exodus Happened 2450 B.C.". I read it from cover to cover before going to bed and then poked about your biblicalchronologist.org web site later when I couldn't sleep. Such was the mind-whirling effect of your book. Thanks SO MUCH for your thoughtfulness in sending it to us (even if it was the cause of a short night!). I so much appreciate all your research and labors on behalf of the body of Christ. I think the work you are doing is just so extremely valuable. The biblical imperative of 1 Peter 3:15 comes to mind, that of being ready/prepared to give an answer (defense) to everyone who asks us to give them the reason for the hope we have. I am more convinced than ever of the need to be equipped to provide, careful, gentle, logical, biblical and scientifically-grounded answers to an unbelieving and searching world. In my view, your research and materials contribute much to the equipping process. May God encourage you in your endeavors.